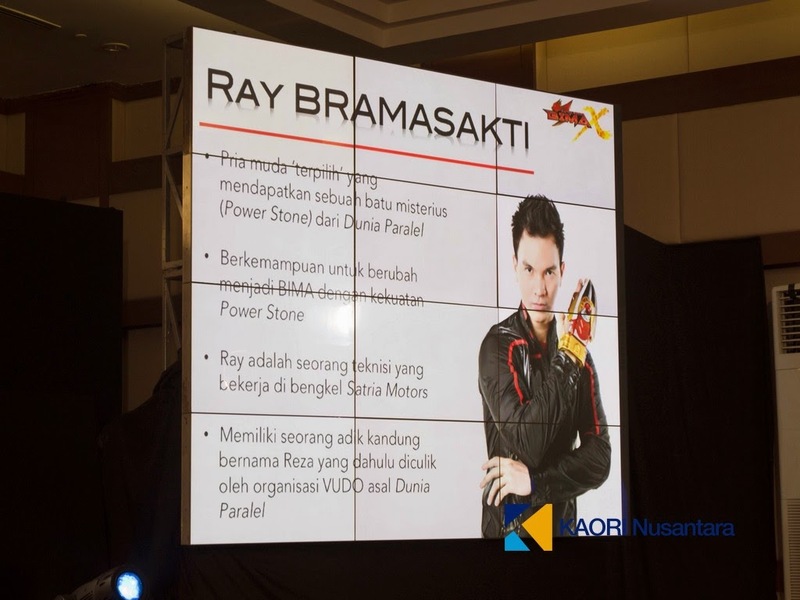 As BIMA, Ray is granted the agility, focus and strength of a Garuda. He also uses a weapon named Helios. When called, Helios will come flying out from the sun. 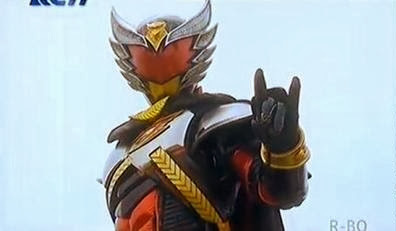 His finishing move, the Garuda Strike. 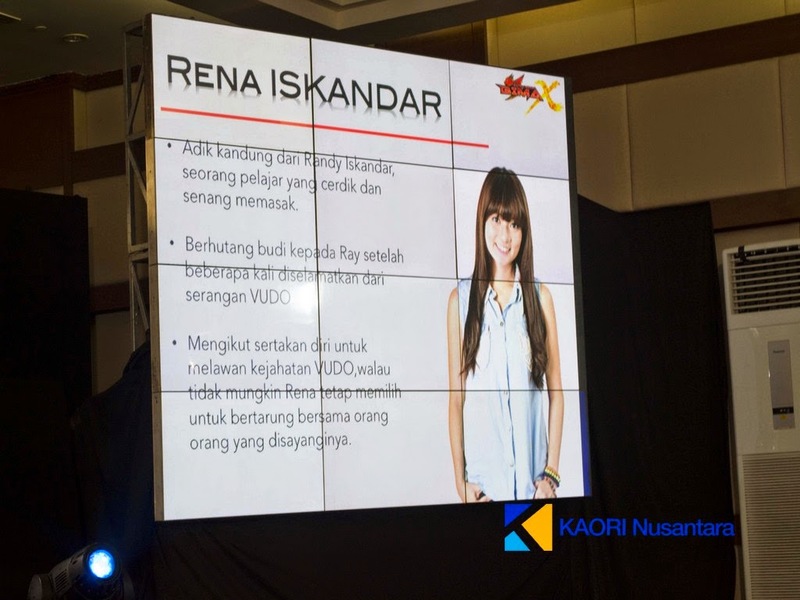 Rena Iskandar is the younger sister Randy. She had a heart innocent and naive, but often disadvantaged because often the target of the enemy. 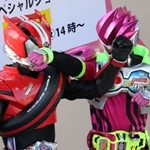 But behind that he always tried to help Bima. Though she admires both Randy and Ray, and she love with Ray. Rasputin is the head of the evil organization VUDO, which comes from a parallel world to take on the earth elements, such as oxygen, water, and sunlight. It uses the power of the Black Power Stone as main power resource. 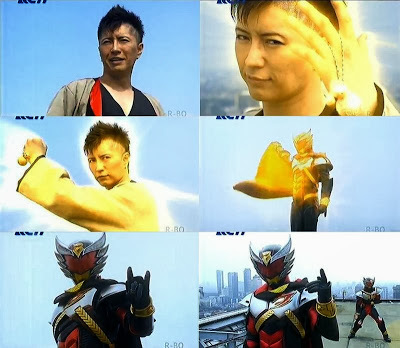 He have a right hand man by the name of Iron Mask, which acts as the captain of their warship. The face behind the mask is not known whom, however, he has the power of Blue Power Stone. There is also a guy called Azazel who fights BIMA for Rasputin. He has weapons called Toranus (God of Thunder). 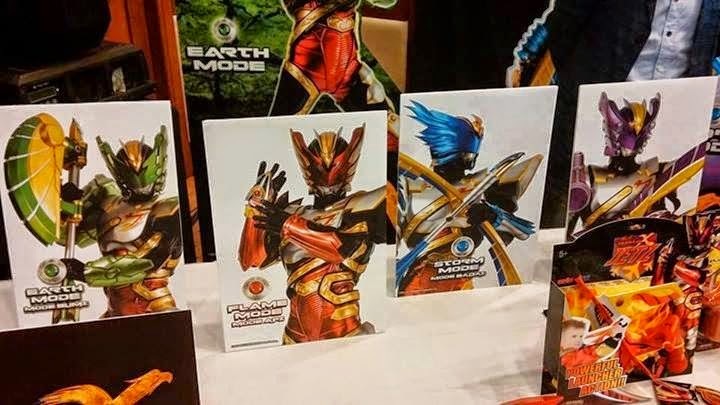 And finally, here's a good look at BIMA Satria Garuda via the recently uploaded trailer from RCTI official YouTube page, and a press conference video courtesy of YouTuber herlina tambunan. 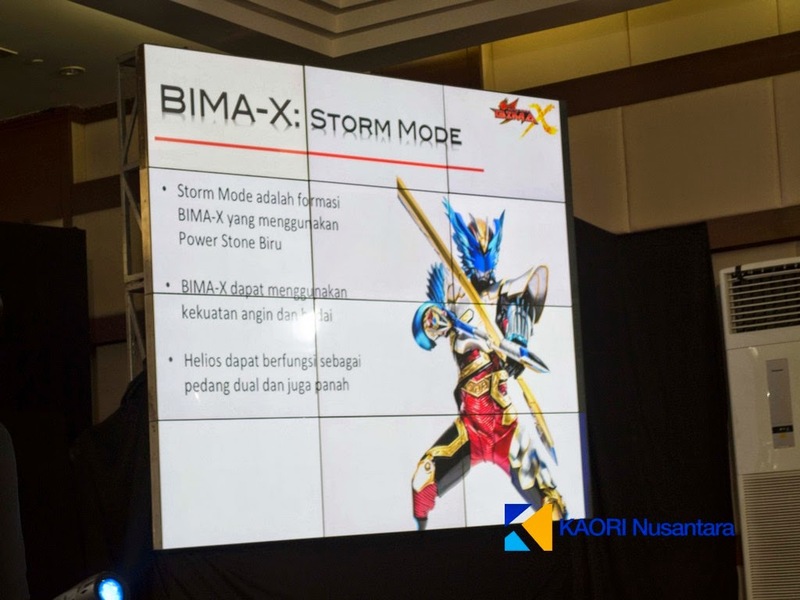 We all know that Ishimori Production is involved with the creation of Indonesia's latest superhero series, BIMA Satria Garuda, it makes sense for fans to wonder how much they are involved with it. Turns out, a lot of the staff of the series came from Japan! Masato Hayase who designed characters in a lot of Kamen Rider shows (Agito-555, Hibiki-OOO) and wrote the Sea Jetter Kaito manga, S.I.C. 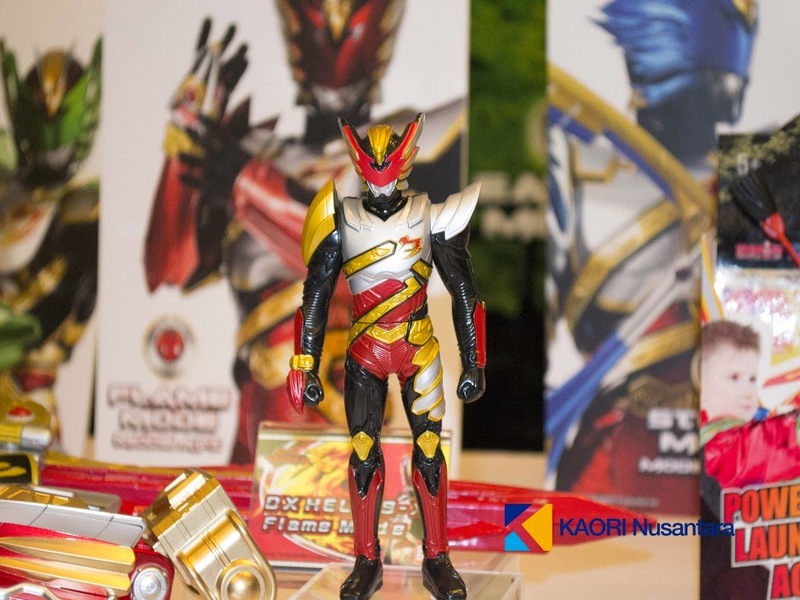 Hero Saga novels and Kamen Rider Eve is the show's designer and series head writer. In addition, Ishimori Production is handling the fight choreography, three of which are Japanese. Lastly, the show's director and cameraman are also Japanese, same goes with the equipment used in making the series. 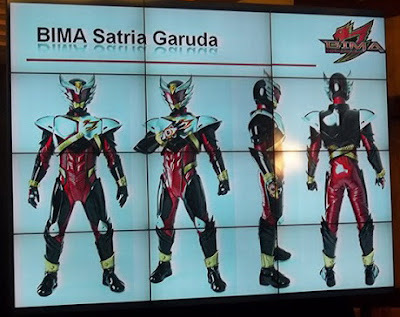 BIMA Satria Garuda will have 26 episodes, which will begin airing this June 30 every Sunday at 8:30 am with replays every Saturday at 3:00 pm on RCTI. Sieht sehr interessant aus. Ich bin gespannt. Der Helm hat was von rescue hero und rescue force. 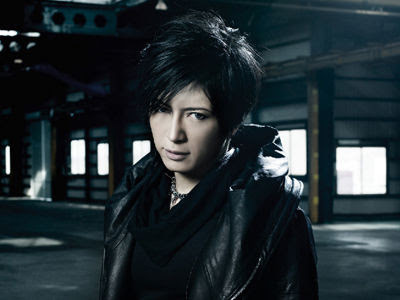 On May 21st, the official Facebook page for BIMA posted a couple of Gackt's information. 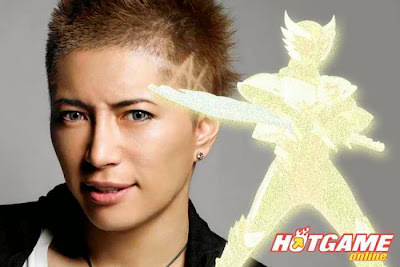 Gackt is not new in tokusatsu. 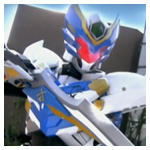 In 2009, he sung Kamen Rider Decade's theme songs “Journey through the Decade”, “NEXT DECADE” and “Stay the Ride Alive”, and starred in its theatrical film as Decade's iteration of the character Jōji Yūki. Recently, he starred as Oda Nobunaga in the Sengoku Basara: Moonlight Party live action series. Led by the enigmatic Rasputin, the evil organization VUDO came from a parallel universe to steal the natural resources of Earth like oxygen, water and sunlight. Ray, a young man from Earth, was chosen to be a hero to protect the Earth from the evil invaders' attack. 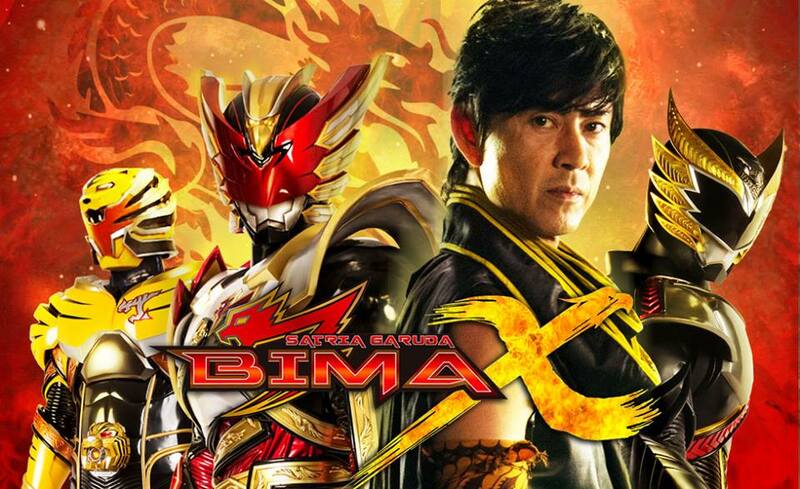 Scheduled for 26 episodes, BIMA Satria Garuda starts airing on June 30th (Sunday) at 8:30 AM, with replays every Saturday at 3:00 PM on RCTI. 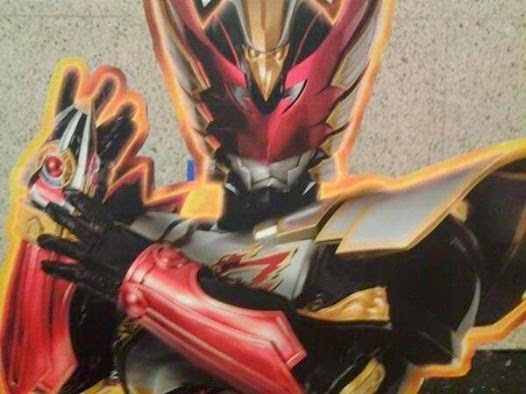 After Gackt give out his interest in joining the cast, BIMA Satria Garuda executive producer Reino Barack confirms that the Japanese artist will be making an appearance in the future episodes of Indonesia's latest tokusatsu hero. 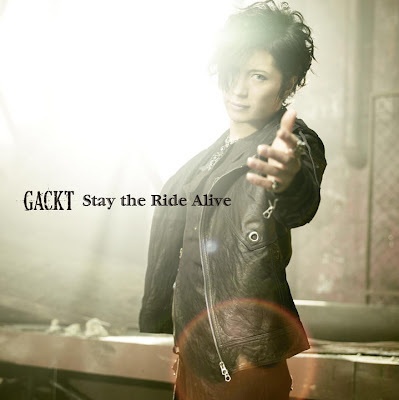 In Barack's tweet, he announces that Gackt will be going to Jakarta, Indonesia on September 22nd to film a few episodes. 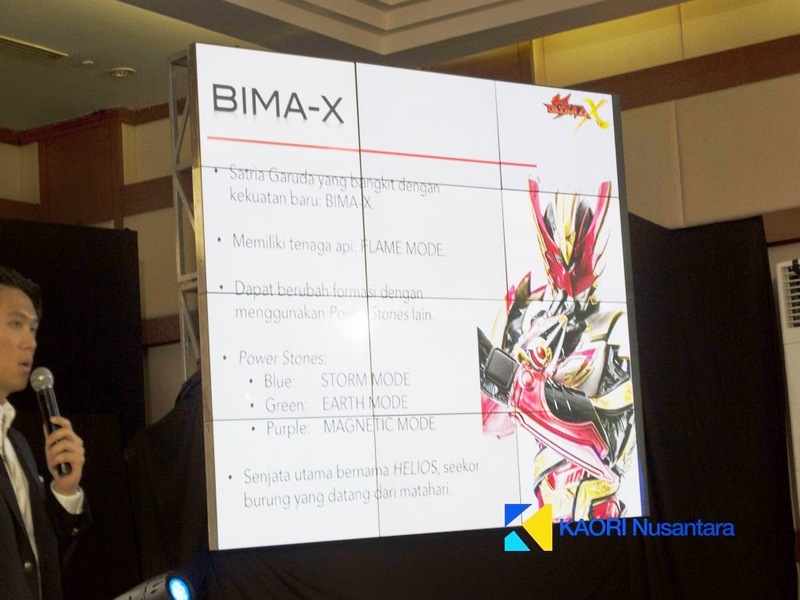 In the Bima Satria Garuda booth of this year's Anime Festival Asia Indonesia, fans learned that just like the titular hero of all Heisei Kamen Rider shows, Bima will also gain his own final form. 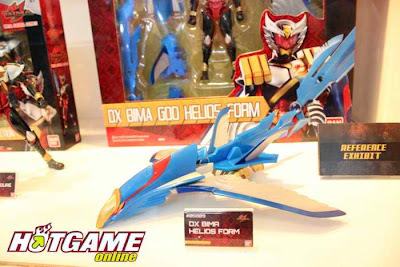 Revealed in a new figure displayed in the booth, this new form is called the "Bima God Helios Form", which he will obtain later in the series. 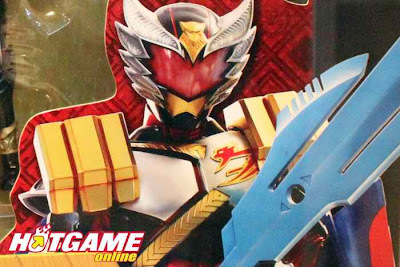 To achieve this form, he will fuse with a blue eagle called "God Helios", giving him a new armor and weapon. 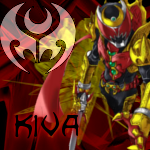 Aside from helping him gain access this new form, God Helios can also aide Bima in his battle against the Vudo. 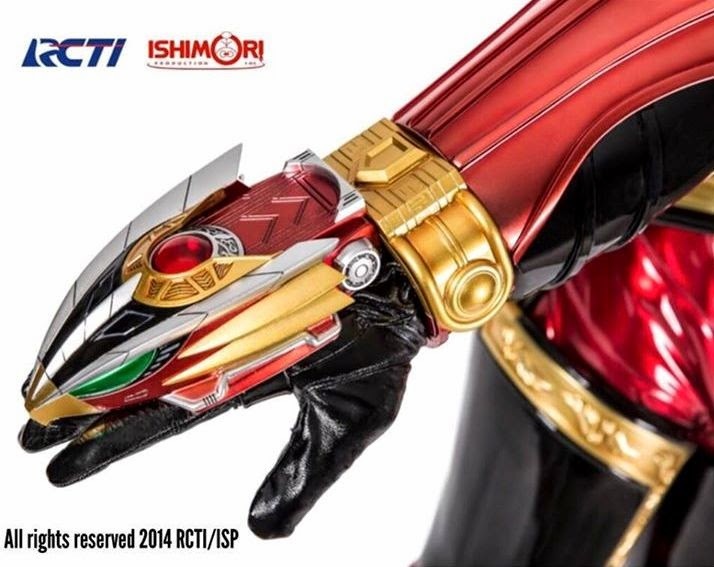 BIMA Satria Garuda will have 26 episodes and is currently airing on RCTI in Indonesia every Sunday at 8:30 am with replays every Saturday at 3:00 pm. There are also plans to release the show overseas, planned countries include Malaysia, Singapore and Brunei. 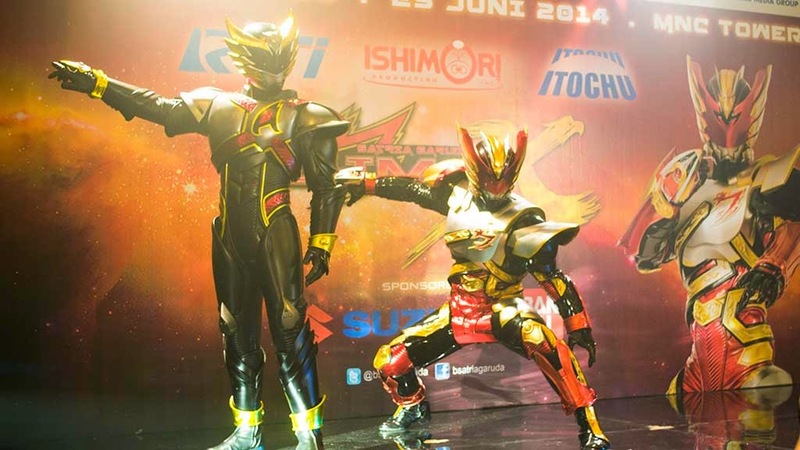 It was previously reported that Gackt will make an appearance in Indonesian tokusatsu series BIMA Satria Garuda. Just recently, we have more info on what role he will play in the series! Gackt will play the role of Bima Legend, a warrior from a parallel world that fought VUDO hundreds of years ago. 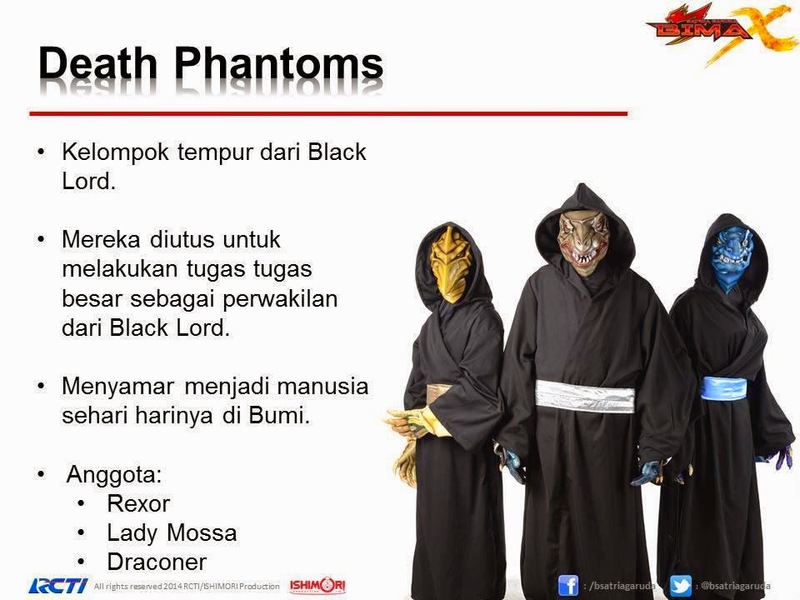 He will appear in the show's 22nd and 23rd episodes and is speculated by fans that will give Bima the God Helios Form. 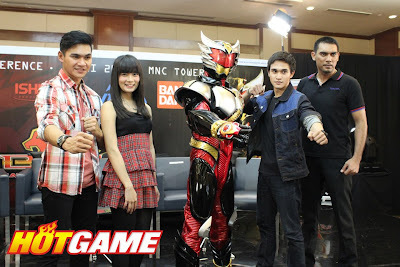 Lastly, JKT48 member Haruka Nakagawa will guest star in the said series, which will end in the episode 26. 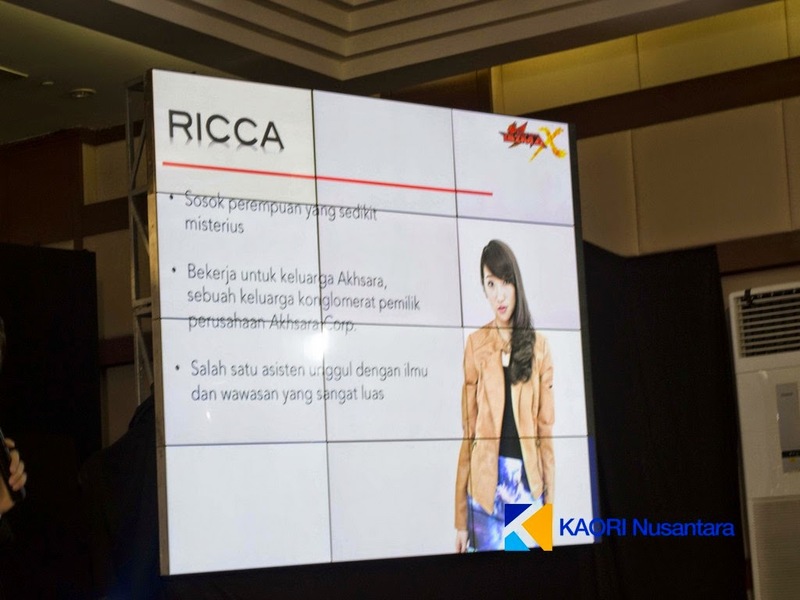 She is the 3rd member of JKT48 member who appeared in the series. Previous JKT48 members that appeared in the series are Stella Cornelia and Frieska Anastasia. 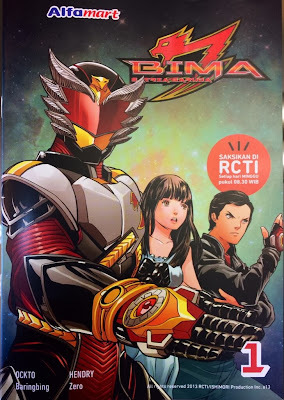 The official Twitter account of BIMA Satria Garuda producer Reino Barack posted a cover of the BIMA Satria Garuda comic, which will be released this November 24, 2013. Hat jemand schon etwas von der Serie gesehen? Ich hatte auf Youtube mal subs von den ersten zwei folgen oder so gesehen aber die scheinen mittlerweile auch weg zu sein. 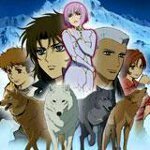 Finde es allgemein schade das es keine Subgruppen gibt die sich den nciht japanischen Helden Serien annehmen wollen. Das ist echt schade. Würde auch gerne die Serie gesubt sehen. Is halt die sache das es so selten is das man jemanden findet der die sprache beherrscht,sich dann noch für tokus intressiert und zudem noch das ganze übersetzen will. 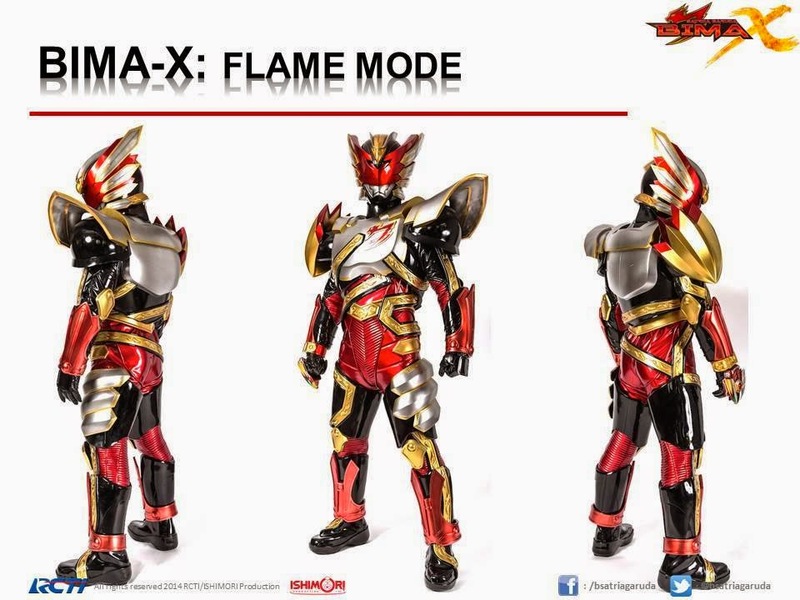 BIMA Satria Garuda: Bima Legend Transforms! 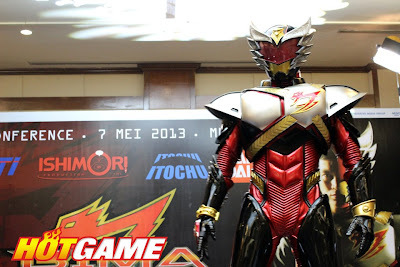 Gackt finally made his appearance in the Indonesian tokusatsu series, BIMA Satria Garuda as Bima Legend. Seen below is his transformation sequence. 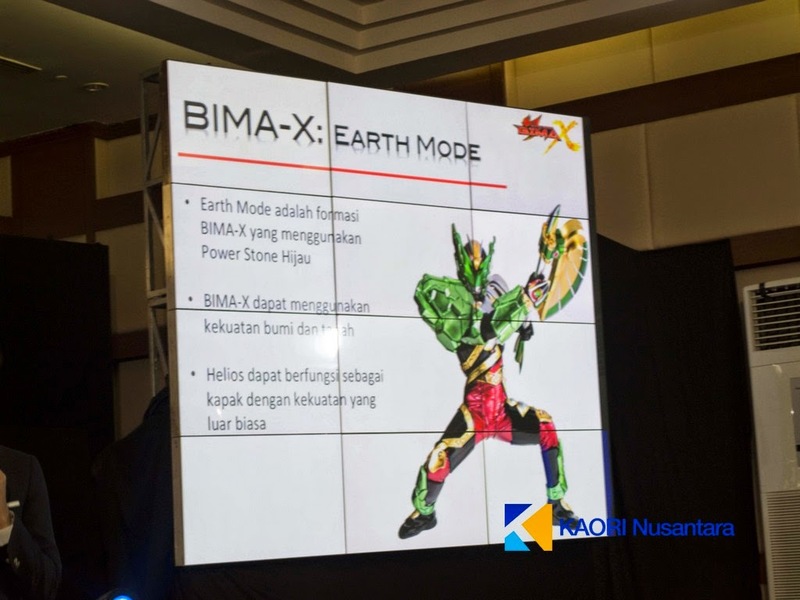 Bima Legend, a warrior from a parallel world that fought VUDO hundreds of years ago. He will appear in two episodes of the series, which will end in episode 26. 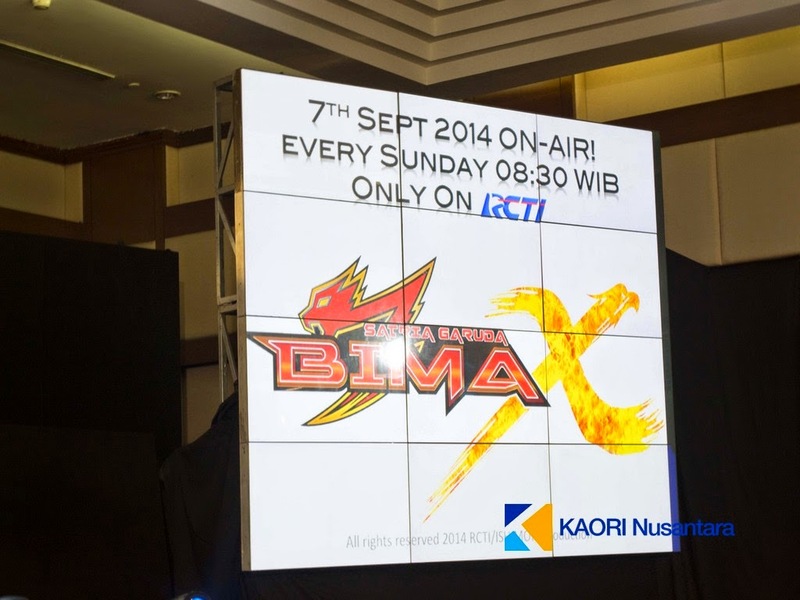 BIMA Satria Garuda airs every Sunday at 8:30 am with replays every Saturday at 3:00 pm on RCTI. There are also plans to release the show overseas, planned countries include Malaysia, Singapore and Brunei. Hab welche gefunden und werds mal anschauen. Sieht nämlich echt gut aus und bin daher sehr gespannt drauf. Schade das es nur 26 Folgen geworden sind. Bisher bin ich sehr von der Bima angetan. Klar die Story ist jetzt nicht gerade revolutionär und die Charakter etwas klischeehaft und flach. Hier und da merkt man der Serie auch an das sie ein sehr geringes Budget zur Verfügung hatte. Aber als gesamtes lebt Bima von einem ganz besonderen Charme der gerade von seinen Japanischen Wurzeln profitiert dabei aber stets eigenständig bleibt. Wer Fan von klassischen Tokus ist und gerne mal was anderes sehen möchte, dem kann ich Bima nur an's Herz legen! Bin schon gespannt wie es weiter geht. Ach haben die das jetz mal fertig? Ich wart schon seit Anfang des Jahres auf die letzten 2 Folgen. Und jetz nach dem ReBoot vom Laptop find ich die Seite nicht mehr. Nun endlich fertig geschaut. In der 2. Hälfte dreht BIMA richtig auf und legt qualitativ in Sachen Story, Charaktere und Fights ein Stück oben drauf. Was mir nicht ganz so gut gefallen hat, ist das viel zu viele Fragen offen geblieben sind. Selbst die letzte Folge endet sogar mit einem Chliffhanger. Was auf eine mögliche Fortsetzung der Serie hoffen lässt. Ich hatte viel Freude mit BIMA und kann daher die Serie nur weiter empfehlen! 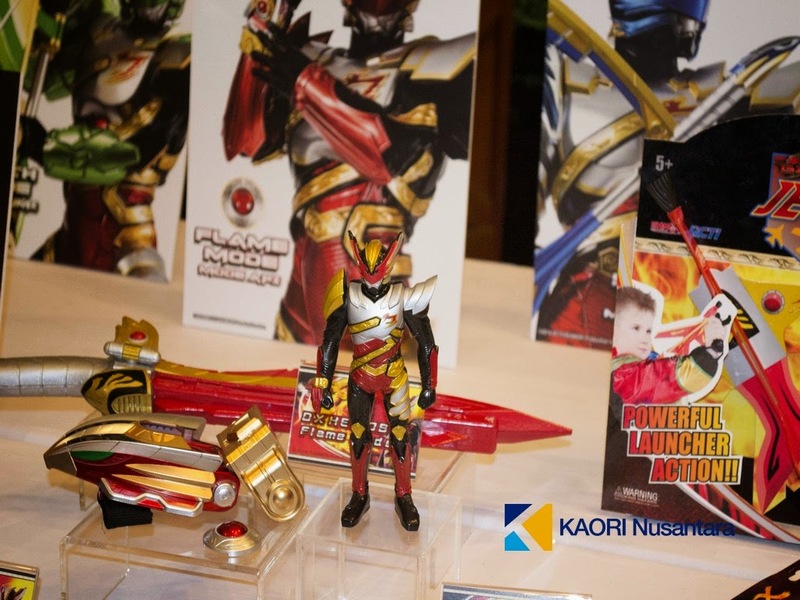 Die sind einige der Bima Satria Series, die von BANDAI hergestellt. 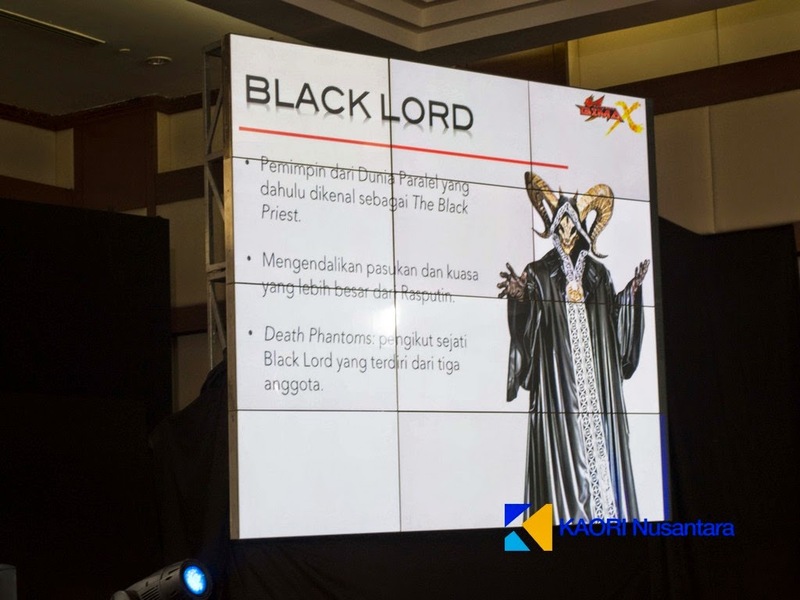 Vor dem Ende des Series in Indonesien, wurde Comics, deren Geschichte basierend auf dem Series sind, herausgegeben. Der Verkauf der Comics ist bisher in Laden Alfamart gemacht worden und es gibt schon 4 Volumen überall. Es kostet 7.500 Rupiah oder rund 50 cent Euro pro Buch. 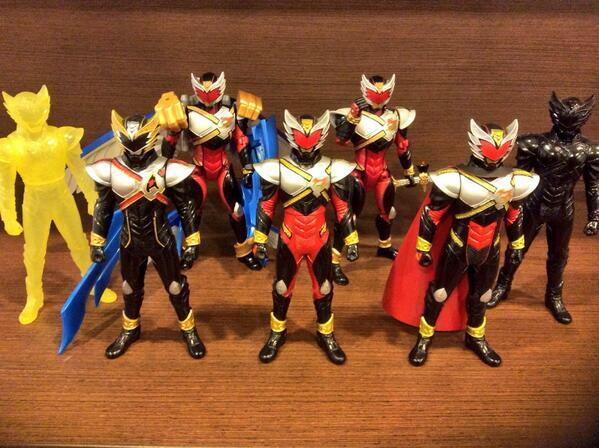 The official BIMA Satria Garuda posted a new image, which is then followed with the words "New Power... New Hope". 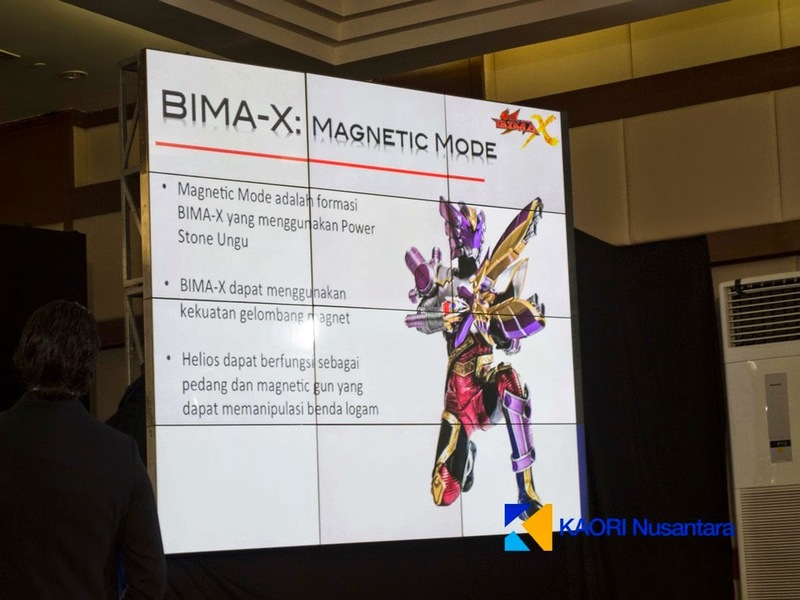 What's interesting about the new image is that it features BIMA wearing a new brace. 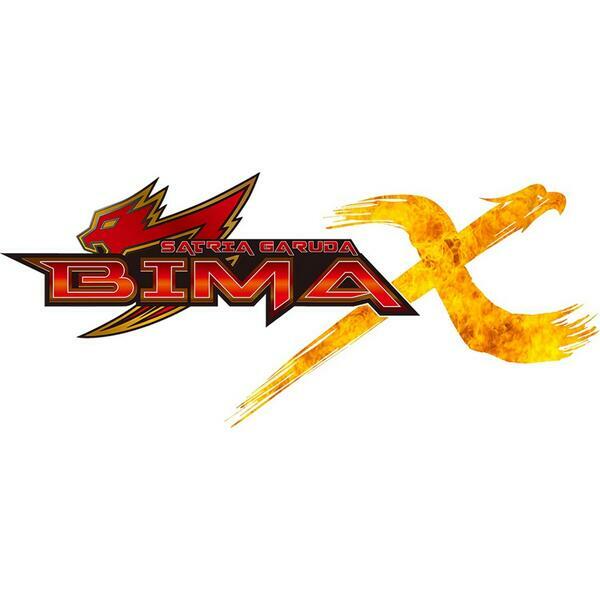 The original BIMA transformation device doesn't feature an eagle design. Is this a sign for a second BIMA season? Es gibt Rumor, dass Bima einige Upgrade-Formen haben wird. Der Power-Stone kann mit anderen Power-Stones getauscht werden und jeder macht neue Form. Es gibt 7 Power-Stones : rote und blau (gehören Bima), schwarz (gehört Azazel), grün, weiß, violett, und gelb. Leider wird Azazel keine neue Form erhalten. Aber es wird einen neuen Satria geben, außer Bima und Azazel. 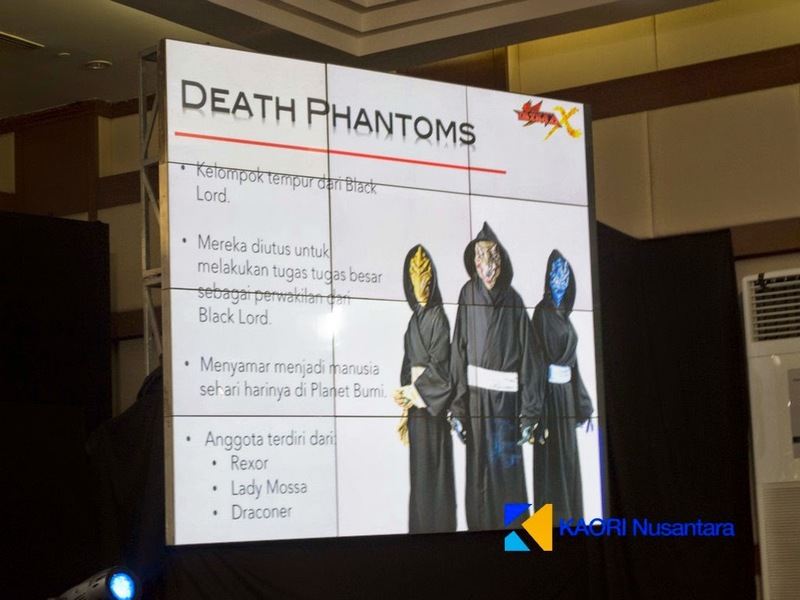 Hier ist der offizielle Vorspann von Bima Satria Garuda X. Press Conference findet am 25. Juni 2014 in Jakarta, Indonesien statt. 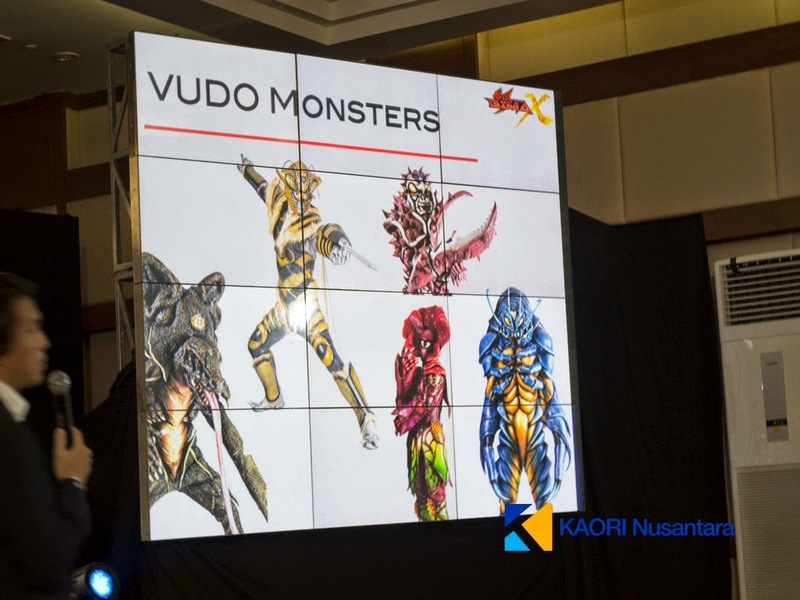 New details of BIMA Satria Garuda X revealed new enemies and of course, the release date of this season! 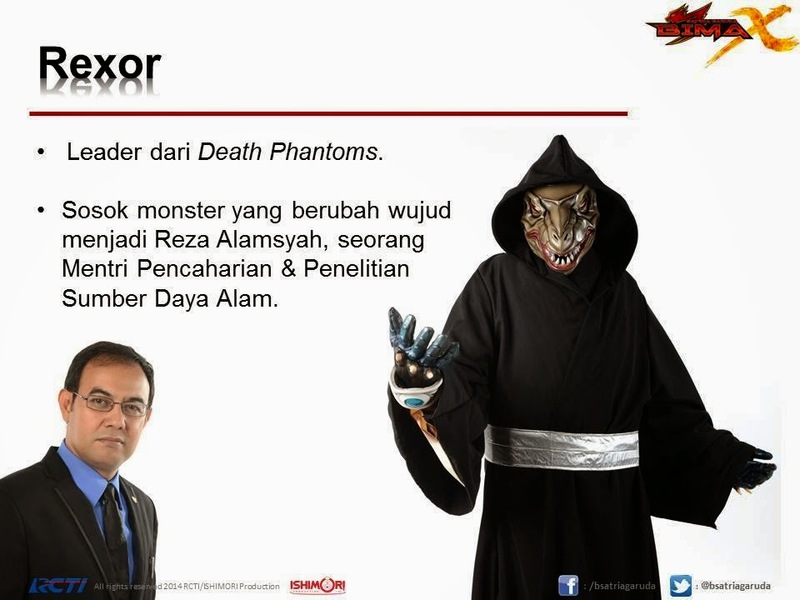 - Rexor, the leader of the Death Phantoms and takes the disguise of politician Reza Alamsyah. - Lady Mossa, who takes the disguise of Amestina Seraphine, the owner of a jewelry shop. 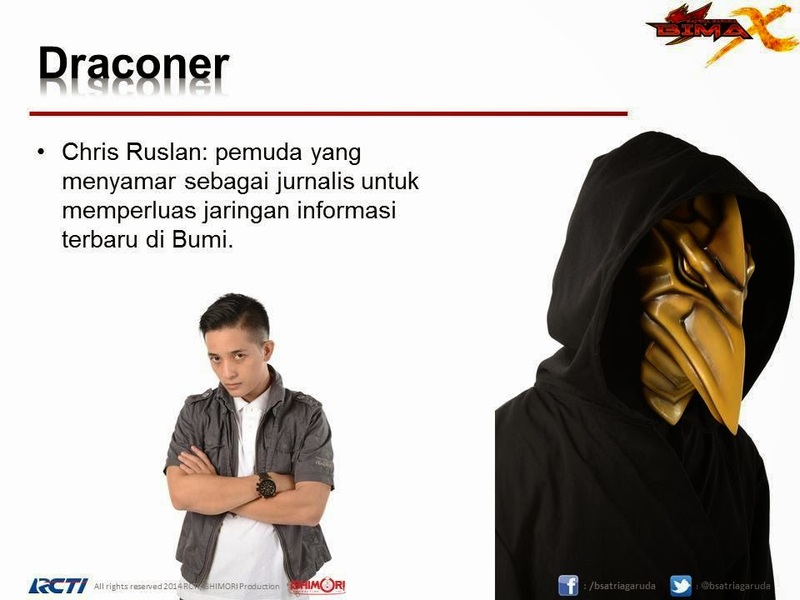 - Draconer, who takes the disguise of Chris Ruslan, a journalist. 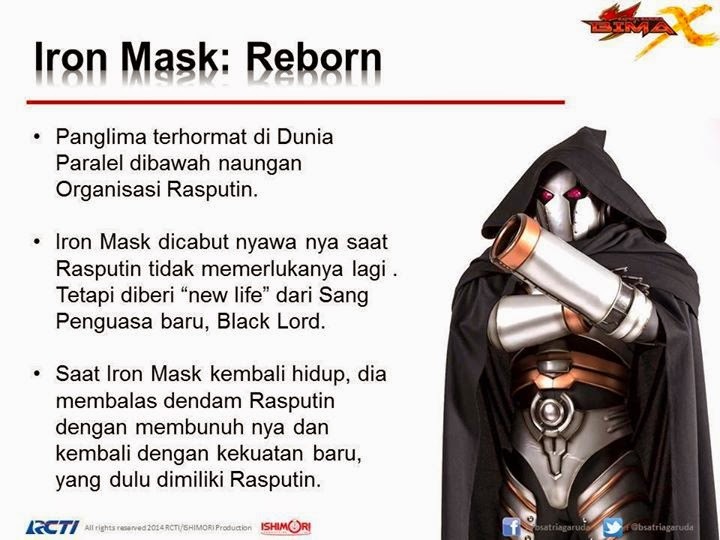 In addition, Iron Mask returns in this season, with new powers that he supposedly got after he killed Rasputin in the previous season. 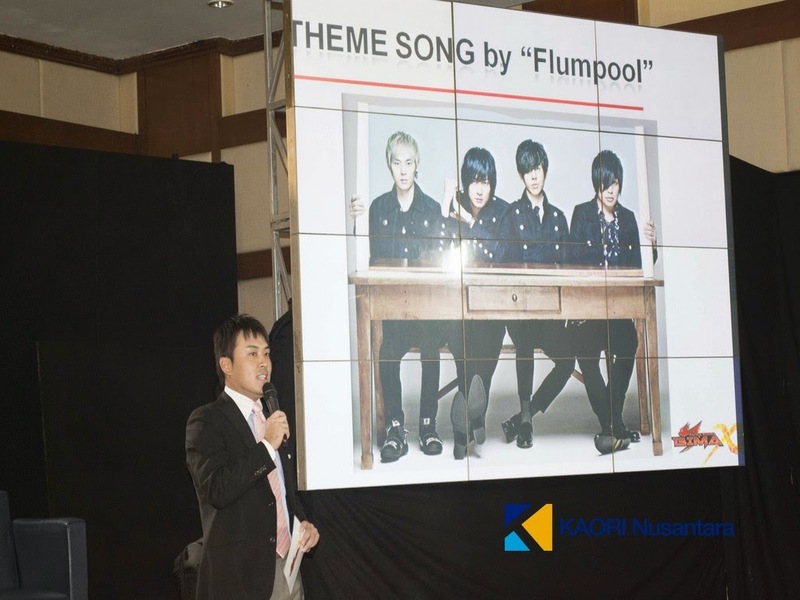 Lastly, Japanese band flumpool (Captain Earth) will perform the ending theme for this season. 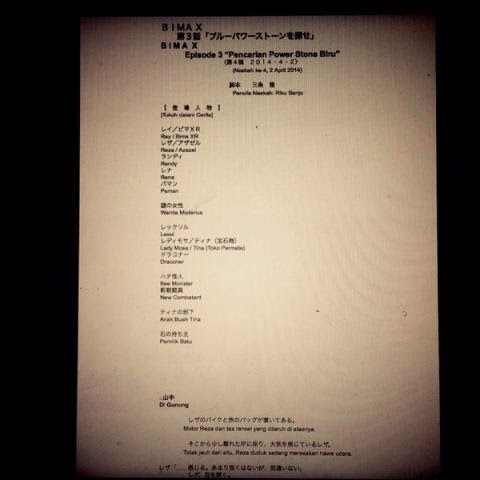 It is still unknown on who will perform the show's opening theme. 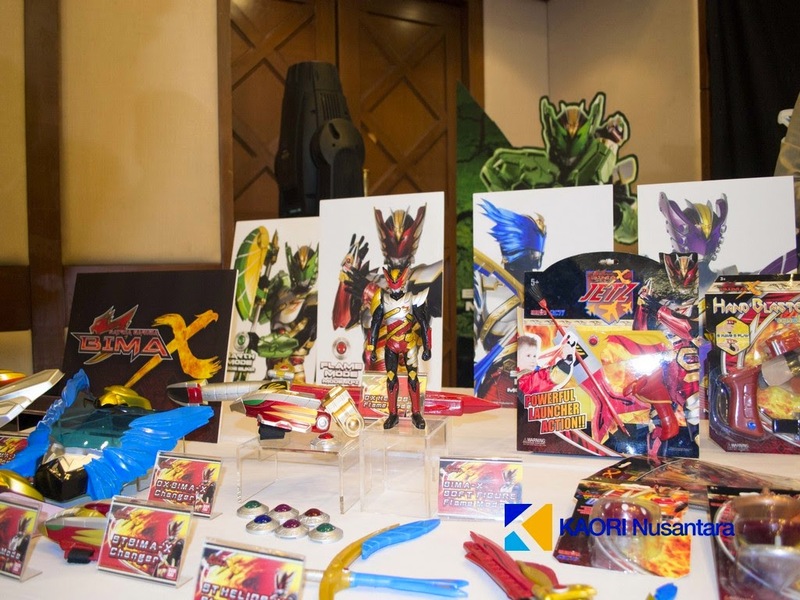 Riku Sanjou Wrote a Satria Garuda BIMA-X Episode? 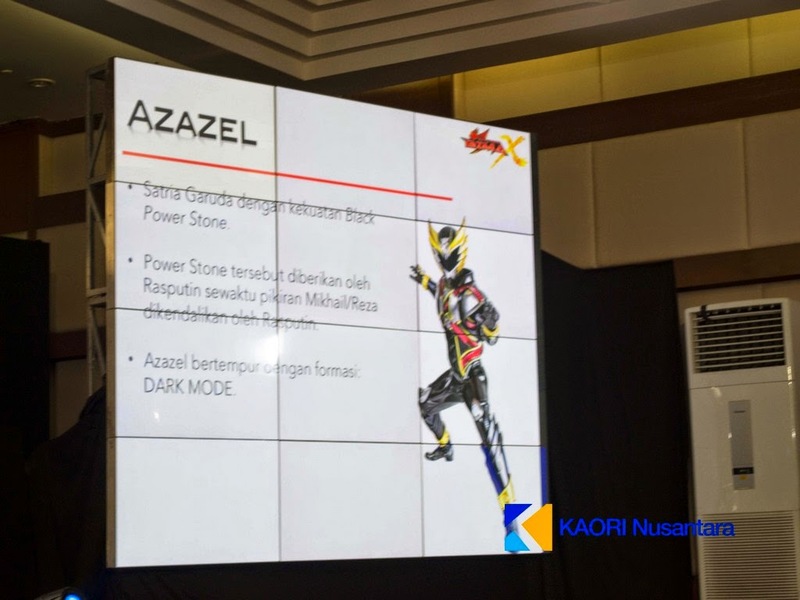 An alleged script for Satria Garuda BIMA-X's 3rd episode has surfaced online, which revealed that a Japanese writer will write said episode. But who is this writer? Upon closer inspection of the image, it credits Riku Sanjou as the writer of the said episode. 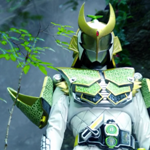 Tokusatsu fans best remember Sanjou for his work in Kamen Rider W and Zyuden Sentai Kyoryuger. Outside of tokusatsu, he is the author of the Beet the Vandal Buster manga. Hat jemand vieleicht per PN einen Link für mich zu einer Sub-Crew die etwas davon Übersetzt hat ? 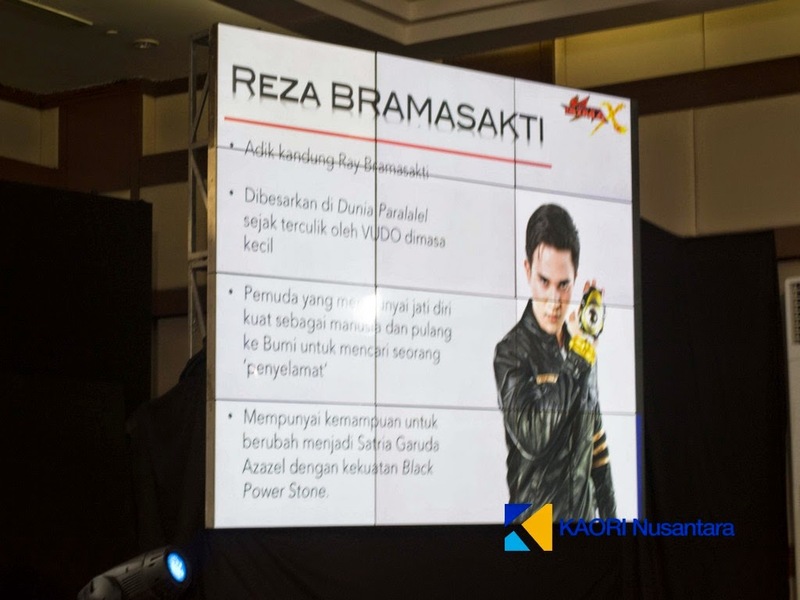 Actor Tetsuo Kurata, best known as Kotaro Minami aka Kamen Rider BLACK was in Indonesia recently, and what's interesting is that he will make an appearance in the Satria Garuda BIMA-X TV series! 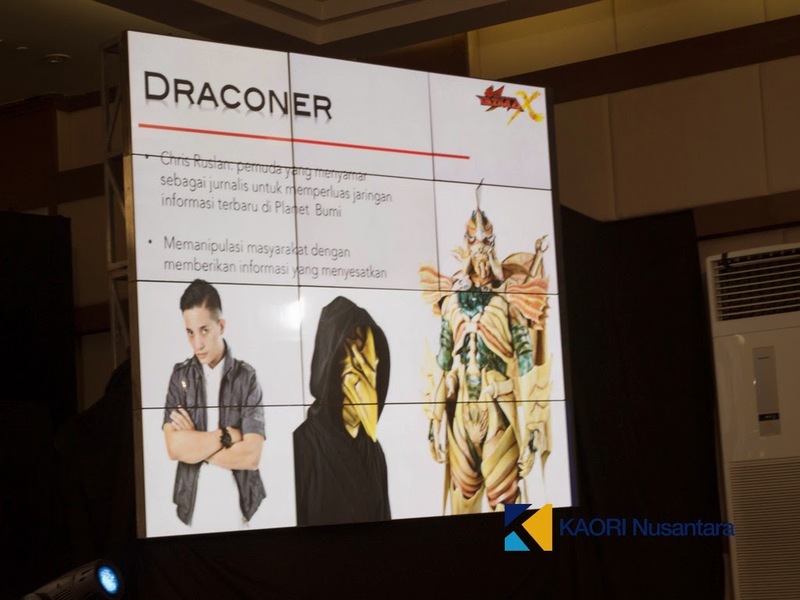 He will play the role of Ko, a mysterious wanderer who can travel in different dimensions. He's a man who likes to help others and apparently, he does not have a definite purpose in life outside of helping others. It is still unknown on what episode he will appear in the TV series. 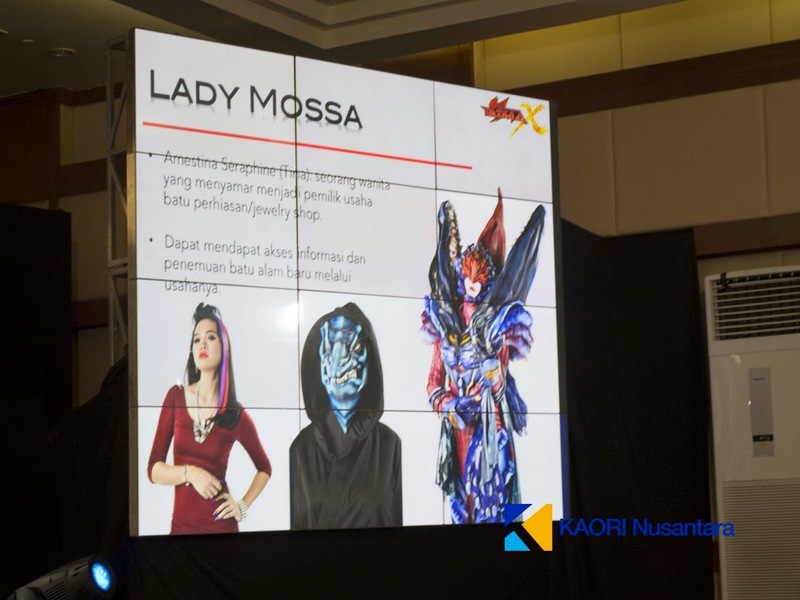 Outside of BIMA-X, he already appeared in an Indonesian variety show. 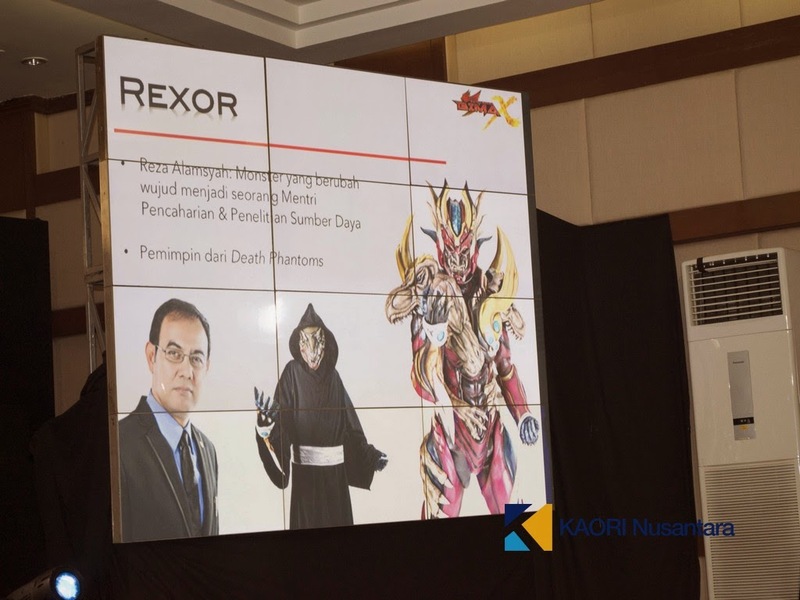 Last time, we have seen Tetsuo Kurata, known for his role as Minami Kotaro of Kamen Rider Black and Kamen Rider Black RX, guest star in an Indonesian talk show. 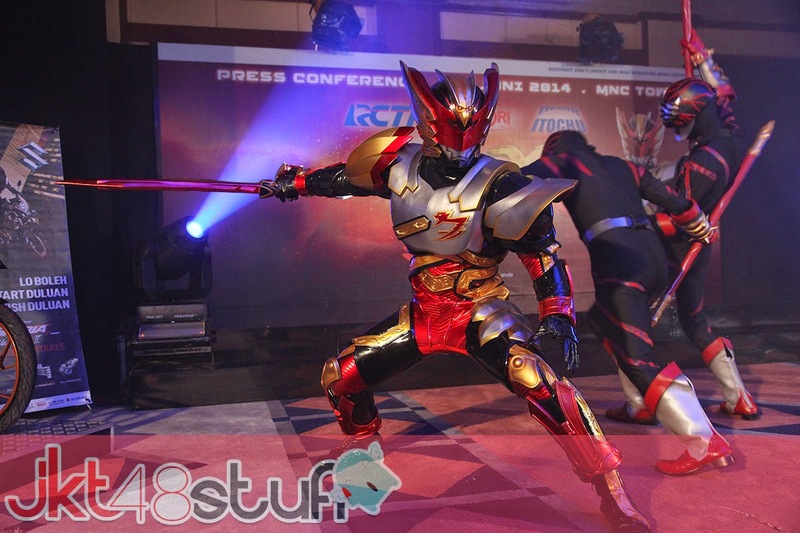 Now, he will guest star in the 41st episode of the Indonesian Toku series, Satria Garuda Bima X! 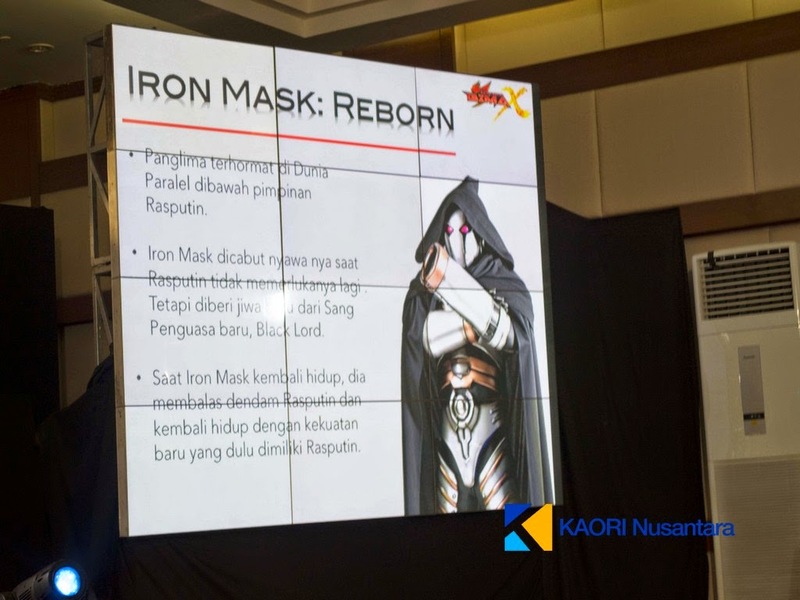 Yes, the legendary Tetsuo Kurata will have a vital role in the series as a warrior named Kou and he will be speaking his lines in Indonesian. The episode will air this sunday, June 21 at RCTI.